This is the Artec Band Control Unit. The "BCU" is a built-in "Cure All" for tone junkies. 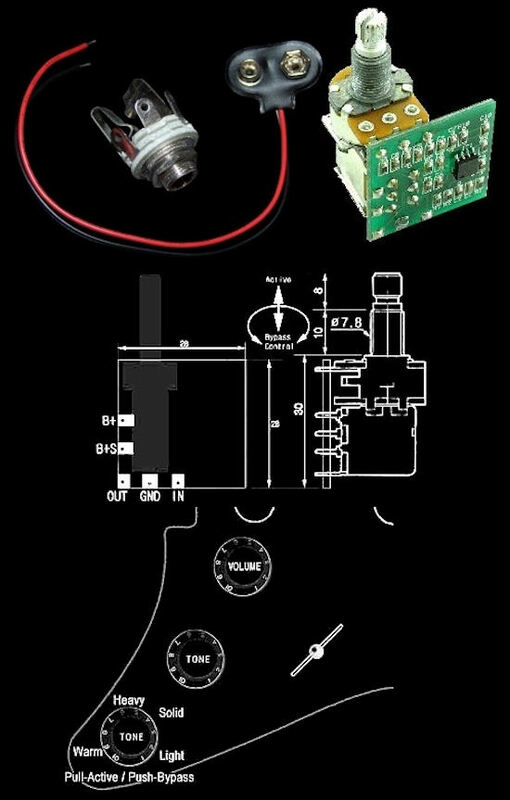 First of all, this multi tasking unit features a push/pull on/off sending the unit to a true bypass mode when you push/pull on your knob. When in the "on" position, the knob functions as a Tone Expander. In the center (knob at about 5), it is a Harmonic Boost (adds lots of Sustain, and Harmonic Boost, with a slight mid-high band shift on the EQ). As you turn your knob down, you increase the Midrange in your sound. Giving you enough chunk to make a single coil sound as thick as a humbucker. However, if you turn the knob in the other direction, you boost the High & Low end of your tone (Scooping the Mids, like a "V" shaped EQ). This is very similar to the mod used by such legends as Eric Clapton. Easy installation with any Passive or Active pickups in your Guitar	or Bass (no modification needed, as it just replaces one of your tone pots). Powered by a 9v battery (1 battery will last more than 4000 hours!!!). 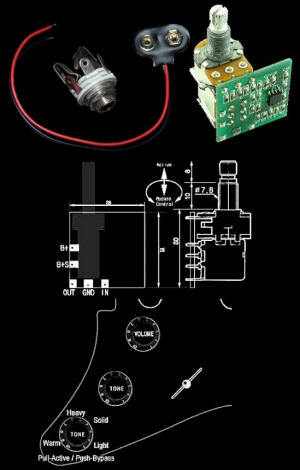 You will receive the Unit itself, as it is pictured, with a Battery Clip, & Stereo Input Jack (incase the one you have on your guitar is Mono), as well as an installation wiring diagram (very easy to follow).